← London 2012, Men’s Pool A: Pakistan 5-4 South Africa. 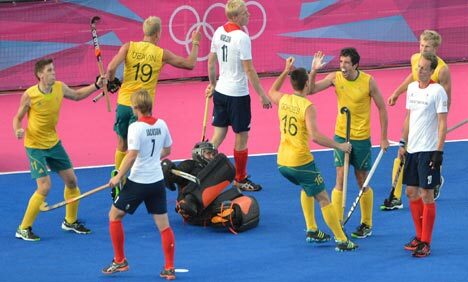 London 2012 Men’s Pool A: Great Britain 3-3 Australia. A stunning second half comeback from Great Britain kept them in the hunt for a semi final place as they clawed their way back from 3-0 down to shock Australia, to the delight of the home crowd. The Kookaburras settled into the game very quickly and forced their opponents into defending deep in their own half. Matt Ghodes and Glenn Turner both went close to opening the scoring as Australia’s movement and width caused a sluggish Great Britain defence all sorts of problems. Eight minutes in, Russell Ford opened the scoring. The No10 collected an aerial pass on the left wing and cut in dangerously along the baseline, before slotting the ball home via the inside of James Fair’s pads. Great Britain hit back and were unlucky not to see Matt Daly’s shot on the turn find the target with Jonty Clarke lurking at the far post. With the crowd still buzzing from that attack, Australia struck again. This time Ford caught the GB defence napping, latching onto a through ball to slide a reverse stick shot under the on-rushing James Fair for 2-0. The hosts were really struggling to live with their opponents, despite the efforts of Ashley Jackson and a typically determined James Tindall. Every time GB looked like creating something, Australia’s blanket defence mopped up the threat and broke the play down. The Kookaburras went close through Turner and Dwyer as they tried to put the game to bed before half time. Great Britain won their first penalty corner, but it was successfully overturned on appeal. Moments later, they did get a penalty corner, but Ashley Jackson’s drag flick was well saved by Nathan Burgers, setting u a break which almost brought the visitors a third. The half time hooter sounded, with Great Britain having nothing to show for their endeavours after an excellent defensive display from their old rivals. The home crowd feared the worst as after the break Australia extended their lead to 3-0. Mark Knowles latched onto a loose clearance in the D and fizzed a shot into the bottom corner. Australia were threatening to run riot and Jamie Dwyer, now the all time record scorer for his team, missed a gilt-edged chance at the back post. 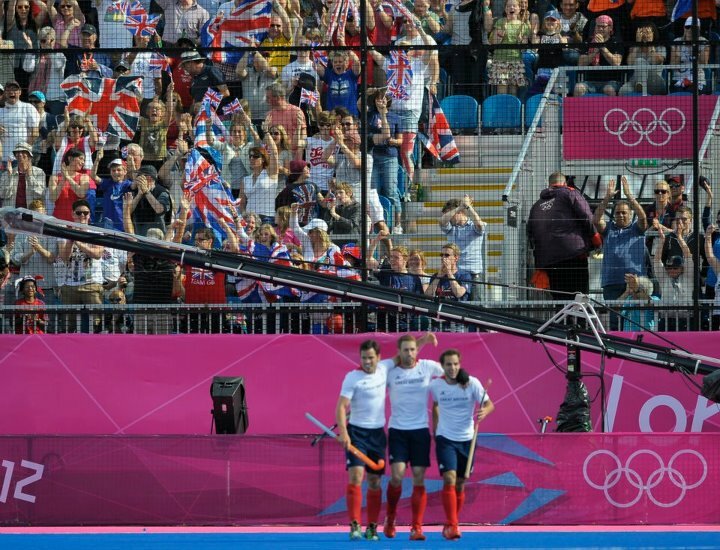 Great Britain got themselves on the board at last in the 47th minute. Harry Martin, who had a splendid game, got round the back and his cross was turned home by Jonty Clarke to give the hosts a glimmer of hope. Barry Middleton and Martin began to grow in influence, and now it was Australia’s turn to be on the back foot. Jackson had a penalty corner saved by Burgers, but from the next award Richard Smith’s precise pass was expertly diverted into the net by a sliding Barry Middleton. The crowd were reaching fever pitch as they dared to dream of their side completing an unlikely comeback. The visitors tempered that enthusiasm winning a penalty corner of their own. James Fair made a fine save from Christopher Ciriello’s drag flick. His clearance launched a counterattack but Ali Wilson was unable to find the final pass. Great Britain were throwing everything at Australia and with four minutes to go, they got the equaliser. A lovely move into the D involving James Tindall and Barry Middleton resulted in the former digging out a shot from under his feet, which clipped a defender’s stick on its way into the far corner. There was more drama when Burgers called for a referral claiming to have been fouled by Iain Mackay. The decision was upheld and Great Britain had snatched an all-important point to keep their semi-final chances in their own hands. Australia will be concerned; having twice let commanding leads slip after dominating the first half. 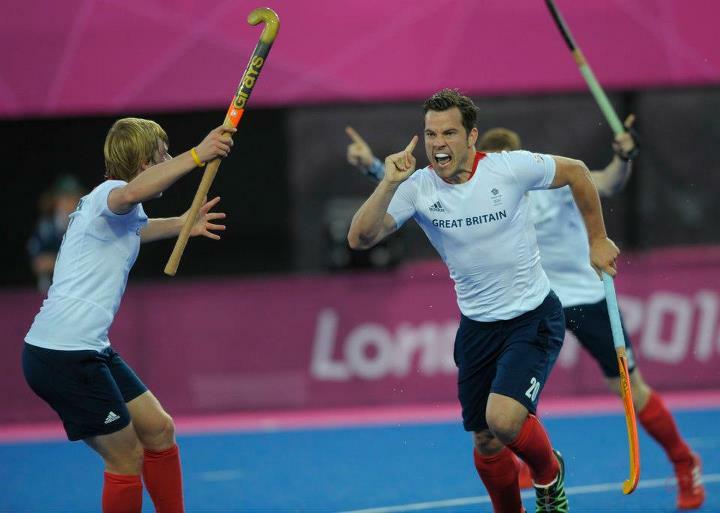 Great Britain will surely be buoyed by the performance, as they approach their final pool game with Spain on Tuesday. Jason Lee’s all out attack philosophy is really paying dividends for his team. With the crowd behind them, do they dare to dream of gold? This entry was posted in London 2012 Men. Bookmark the permalink.